As I’m not going to be around over the Christmas period, I thought I’d share the five images taken this year that I am most happy of. The idea came to me whilst on a train home at the end of a 61 hour work week: I was fighting not to fall asleep and so began going through some photographs on my iPad in an effort to stay awake. It worked as I found myself flicking back and forth between images trying to decide which I liked more. I thought I’d share my choice of top five over the course of the week. I hope you enjoy them. This image was taken in Tel Aviv in early June. I was on a training course at the headquarters of one of our vendors. The days were long and we didn’t finish before 6PM each evening which, considering that sunset was just before 8PM, meant heading straight to the local push bike rental station and a mad dash across central Tel Aviv to the beach in the hope of a hour of photography. If you ever visit Tel Aviv – and you should as it is a great city – the beach is a must: A long golden ribbon of sand stretching from the wall of Old Jaffa to the chic bars and restaurant by the harbour. What I loved about it most was the rhythm – the palpable thrum – of humanity that could be found along its length. The old, the young and the in-between. The athletic, the office worker, the card sharks, the musicians, the friends and the lovers. Everyone was making use of the beach and, as I have described it before, for me it was the heart of the city. One of the nice things is the beach is also west-facing, so if you like the whole ‘sun setting over the sea’ thing then you’re in luck. But I was after something a little more – well to be honest I don’t know what I really wanted, but something that summed up Tel Aviv. And there was only one thing: Youthfulness. Not of body, but of spirit. I found a great spot up near the harbour and it seemed that it was a popular path to get down to the beach. It had this great reflection of light coming off the cobbled stones so I set up an waited for the right moment but it became obvious that I may have chosen the wrong spot as there was a near constant flow of people either heading to, or coming back from, the beach. The resulting images were a mass of ill-defined silhouettes with no focus and no real story. Still I waited and people became curious as to why I was sitting in the middle of a path, camera on tripod and not actually taking photographs. So conversations ensued luck was wished. Then it happened. 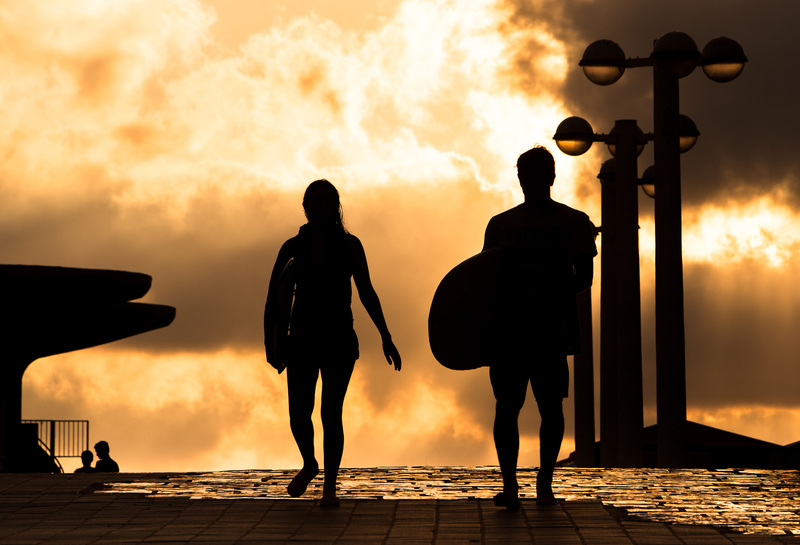 A young couple appeared over the crest of the path carrying surfboards. 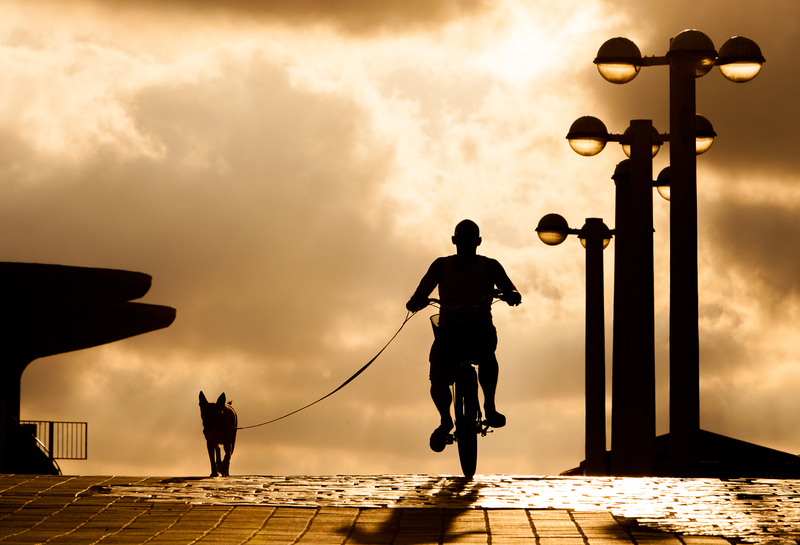 It was what I had been waiting for – the essence of Tel Aviv in my mind. There were very few people around and I had a clear definition of them in silhouette (I love shooting people in silhouette). They knew I was photographing them and so we got talking and they liked the image so email addresses were exchanged. I stuck around a bit longer and I was just thinking of moving on as the light was fading when these two appeared over the crest. It made me smile even as I pressed the shutter. And it made me smile again yesterday after a long and tiring week. I mentioned in recent post that when in Tel Aviv I found myself drawn to two places in particular; the beach and the Azrieli Centre. I’ve written about the beach so today I just wanted to share a couple of pictures from the latter. 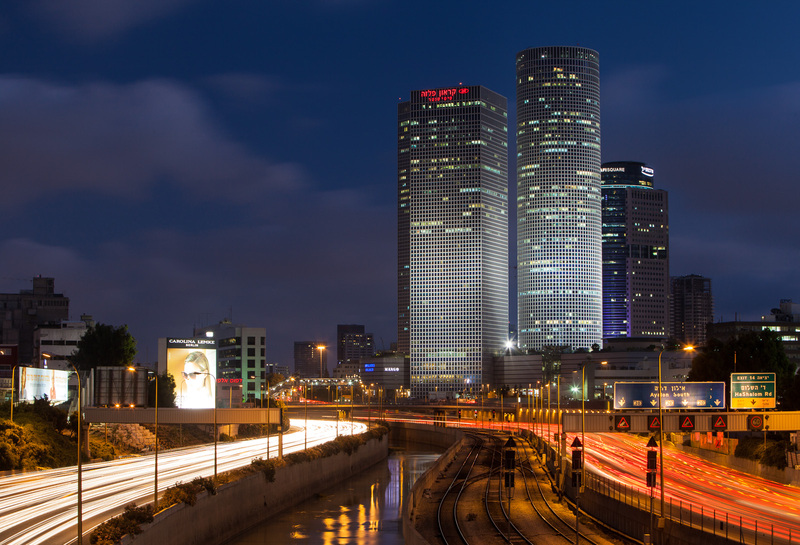 The Azrieli Centre, the third tower of which was completed in 2007, stands out for a couple of reasons. The first, and most obvious, is the size. At 187m, 169m and 154m respectively the towers are a fair bit taller than the few surrounding skyscrapers and significantly taller than the majority of buildings in the area. Secondly there are three of them in a tight cluster, each with a different geometric footprint: One square, one circular and one triangular. 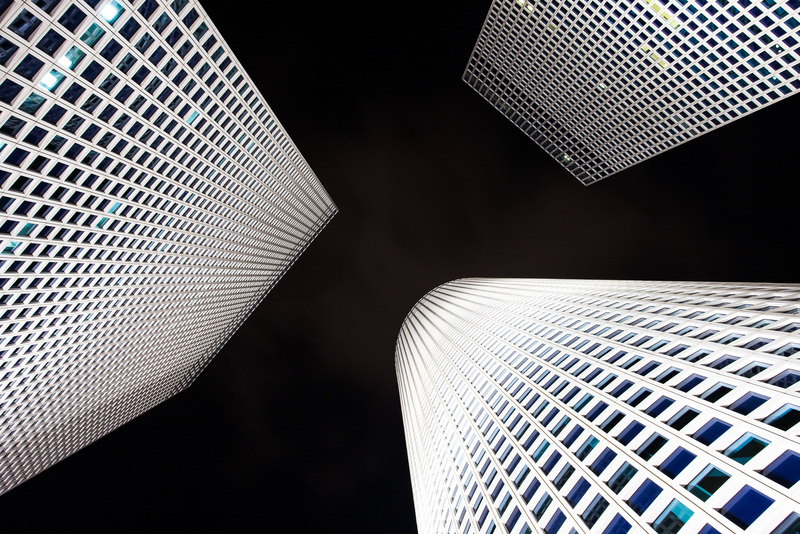 Collectively the towers serve a number of purposes, commercial office space, a hotel, Tel Aviv’s largest shopping centre and an observation deck meaning that they see constant human activity – which is rather the point of architecture. The third is that they are rather elegantly lit at night – no fancy multi-coloured affair, no patterns and definitely no flashing lights. Here are my favourite images from my short time with the Azrieli Centre. I hope you like them. And yes, it is technically the Azrieli Center, but I simply cannot defer to American spelling. Well, after the hassle of industrial action at Ben Gurion airport meant that I was delayed arriving in the UK by six hours, subsequently missing the last train home and thus flying out on my all-expenses-paid weekend trip to Barcelona, I have begun the process of recharging my batteries and adjusting to normal life. The trip saw me first spend a week in Tel Aviv, then off to Jerusalem for a week. I also spent some time in Palestine. Whenever I could I was out with my camera. The weather was unyieldingly hot which, whilst many people’s ideal, was far from mine. It may be my Scottish blood but I much prefer the cold. I found myself struggling to concentrate on my creative side – a process difficult at the best of times. In Tel Aviv I had the added restriction that I was there on a company funded training course and so, as eager as I was to be out and about, that had to take priority. As my old boss once said to a friend and colleague of mine: “Work life pays for home life”. Yes, with the course finishing at 6-6:30PM and sunset at approximately 8PM, photography in Tel Aviv was a fast and furious affair. Whilst nothing focusses the mind like the tick-tock of a clock, there was still the practicalities of getting from A to B to consider. As a city, and this is in no way a criticism, Tel Aviv is pretty much the same as many other coastal Mediterranean cities, which makes photography both easy and complex. Easy in that the same type of shots that work in one city will work in another – cookie-cutter photographs; complex in that it is difficult to take a photograph that is different. As my photography has matured, I have long since stopped taking photographs that (1) are the standard tourist fare and (2) similar to photographs that someone else has taken, unless I believe I can do it better. I’m fascinated by street art (or graffiti if you prefer) and Israel has a thriving street art scene. I’m going to write a separate piece on street art in Israel, but as I arrived in Tel Aviv, my primary objective was to shoot the street art. The other objectives were more vague – having just returned from Iceland and work consuming my evenings and weekends meant little time for researching the trip to Israel. But, in the end I became fascinated by two locations in Tel Aviv. 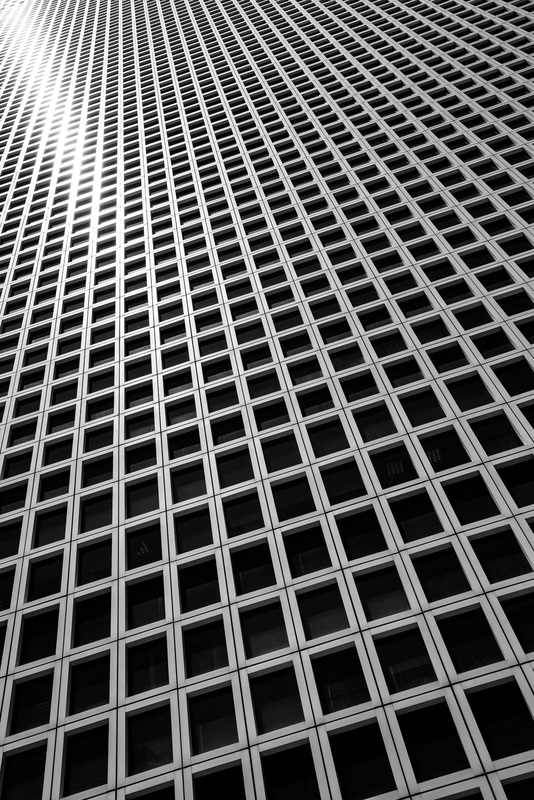 The first was the Azrieli Centre; a complex of three skyscrapers whose geometric simplicity is quite striking. More on this is a separate post. The second was the beach. The last time I was on a beach (a few weeks ago) it was in Iceland at the top of the North Atlantic with ice cold water and a biting wind. This was an altogether different experience with a warm, yet cooling breeze and the much more temperature waters of the Mediterranean. My immediate feeling when I saw the beach was the it felt like everyone was there; the young, the old, the in between. joggers, volleyball players, surfers, people lounging in bars, people sitting on the golden sands, people still dressed in office clothes. Name a demographic and it was probably on the beach somewhere. To me the beach was the heart of Tel Aviv, right on the edge where land had run out. As the beach is generally west facing, the sun set over the sea, making for the classic tourist shot of the sun hitting the horizon. As this kind of shot is a bit of a tourist cliché, it was not one that I was interested in and, to be perfectly honest, I don’t think I could take a very good one anyway. But a west-facing beach did mean one thing – a chance to do something creative with silhouettes. I like silhouette photography. A silhouette in a photograph can hide the fine detail that humans automatically look for upon seeing another human such as eyes, mouth, skin colour and symmetry. A silhouette becomes everyone. It becomes you. Taking photographs of people can be a great way to break the ice. So I found a suitable spot, set up camera and waited. The problem was, as mentioned, the beach is so popular and finding an uncluttered shot was an exercise in patience. In the end it took about an hour and 40 or shot shots to get one I liked, but when it happened I immediately knew that it represented how I saw Tel Aviv; young, healthy and enjoying life. Of course, people become curious when you set up a camera and, unlike a regular tourist, don’t move on after a couple of minutes. Over the course of the hour I got talking to a number of people, including a wonderful older guy and the couple above. So, yes Tel Aviv in many ways is no different from other coastal Mediterranean cities I have been to, but the relationship that the inhabitants of Tel Aviv have with their beach does appear more intimate, perhaps even symbiotic. After all, what good is a beach without footprints in the sand?